As many homeowners know, new entry doors can significantly boost both your home’s curb appeal and its resale value. Also, while it’s important to secure the doors and entrance points at the back and sides of your home, keep in mind that most break-ins occur through the front door. Deadbolts and strong locks are imperative to maintaining the security of your front door. That’s why entry doors from Brock Doors and Windows are designed with a variety of frame and glass technologies that provide outstanding energy efficiency and superior security. Besides security, there are many other reasons to replace your Toronto home’s dated front door. Consider our MasterGrain entry doors from Brock Doors and Windows. MasterGrain fiberglass doors Toronto have superior construction and feature the best wood grain replication on the market. MasterGrain Fiberglass -We know that you’re going to love our beautiful premium lines of fiberglass doors from MasterGrain. Here we have outlined just a few of the advantages they can offer your Toronto home. For one thing, MasterGrain doors are made out of top-quality fiberglass. A MasterGrain fiberglass door looks and feels exactly like real wood, but unlike wood, it won’t rot or warp. Steel doors will dent and rust, but not our MasterGrain entry doors. With virtually zero maintenance, a MasterGrain fiberglass door will bring your Toronto home years and years of durability, energy efficiency, and curb appeal. Our MasterGrain entry doors offer up to four times the insulating value of wood, and they feel warm and inviting to the touch, just like a real wood door. In addition, we offer beautiful wood grain or smooth finish looks, which can be painted or stained. MasterGrain fiberglass entry doors offer your home all the best advantages of steel and wood, but without any of the limitations. All our MasterGrain doors are Energy Star qualified, which means that installing them will help you save on your heating and cooling costs. MasterGrain Selection -Brock Doors and Windows MasterGrain entry doors offer you a wide selection of beautiful, authentic wood-grain textures and finishes that mimic real wood so completely that experts can hardly tell the difference. Choose doors from our gorgeous Rustic or Traditional Cherry Collection, or the Craftsman Fir Grain Collection. MasterGrain NVD Technology -MasterGrain uses two special technologies in order to capture the look and feel of real wood in their fiberglass doors. They begin the process with their patented casting procedure. This procedure is done by hand-selecting the most desirable pieces of wood to build a genuine wooden door. Then a silicone casting is used to accurately pick up each and every detail of the wood grain. This cast is then transferred into a door mold using their Nickel Vapour Deposition technology (NVD). 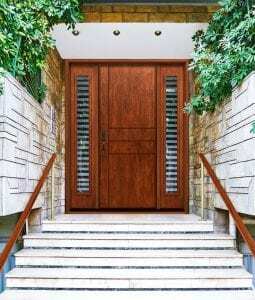 The mold creates “skins” of fiberglass which are used to make MasterGrain doors with natural characteristics and random grains, (just like wood). This attention to detail and the utmost care from beginning to end is what makes them practically indistinguishable from real wood doors.